How do people with ADD and ADHD drive? I really don't know, but I do it on a daily basis! SpongeBob's Boating Bash was developed by ImPulse Games and published by THQ. 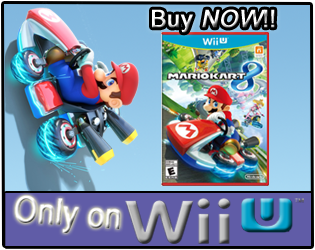 It was released for the Nintendo Wii on March 2, 2010 with a MSRP of $39.99, but the game has since seen price drops from most online retailers. The game received an "Everyone" rating from the ESRB with "Comic Mischief, Mild Cartoon Violence" listed as content for parents/gamers to be aware of. A brief description of SpongeBob's Boating Bash says, "Crash 'N Bash with your favorite SpongeBob character in this exhilarating, fast-paced demolition derby style party game full of excitement for the whole family. Players drive around in cars...er, boats competing within wacky arenas throughout Bikini Bottom to ultimately be the last boat standing!" 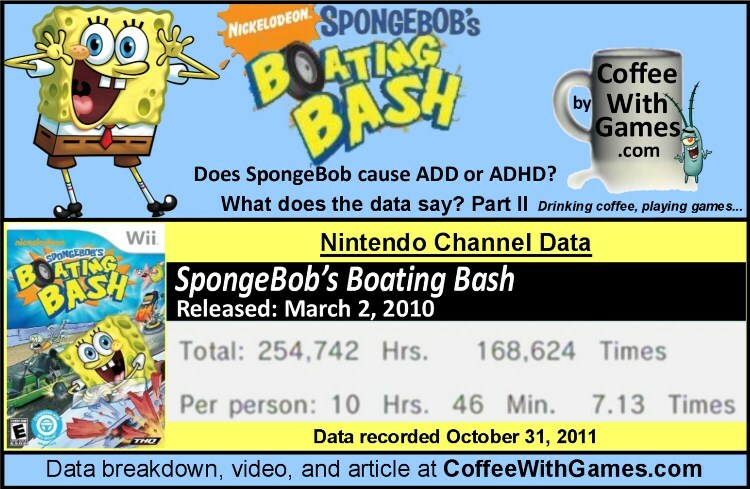 How many hours have Wii owners reported bashing boats in Bikini Bottom with SpongeBob's Boating Bash, and does the reported data perhaps provide any evidence of players having ADD or ADHD? Let's take a look! SpongeBob's Boating Bash has about 23,649 Wii owners that have reported game-play data through the Nintendo Channel, with days possibly reported since the game released. 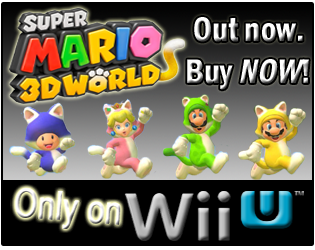 The game's average play-time is 1 Hour 30 Minutes per day/session reported. SpongeBob's Boating Bash's "professional" review score average is 46.50%, based on two reviews on GameRankings.com. Not surprisingly, SpongeBob's Boating Bash has a higher customer review score average on Amazon.com. The game has a 4 out of 5 Stars rating based on 12 customer reviews, and those reviews convert to a 78.33% average on a 100% review scale. In September I did a report on SpongeBob's Truth or Square, and looked at if the reported game-play. You can read that report HERE. I think the reported data for SpongeBob's Boating Bash, specifically the average play-time per day/session reported, shows that Wii owners are playing this game for a decent amount of time, which would probably not be reflective of a child with hyperactive tendencies. I have trouble sitting and playing games for longer than an hour(unless it's you Monster Hunter Tri!) at times, so seeing the average play-time being 1 Hour 30 Minutes I think shows the audience playing the game is sitting down and enjoying it. I also assume that most of the people buying this game are fans of the SpongeBob SquarePants television show, so I would imagine the average play-time would be a lot lower if the report that SpongeBob SquarePants causes ADD had any credibility. As for the title, what is SpongeBob's ADD or ADHD problem? I would say SpongeBob has an issue with learning how to drive, which the cartoon series addressed, and the game takes players through that issue as well. So, I would say it is simply the fact that Mrs. Puff has a boring teaching style, and it isn't necessarily an ADD issue for SpongeBob. I can remember playing Destruction Derby back in the 90s on one of my cousins' PlayStation, and having a blast with it. While I have not played SpongeBob's Boating Bash, the fact that it looks like a demolition derby type game actually makes me very interested in it. The fact that it appears "crashing" is the goal in the game, is probably great for our oldest son since steering would still be an issue for him, and the fact the game can be found for under $20 now is a plus as well. Have any of you played SpongeBob's Boating Bash, and if so, would you recommend it other Wii owners that are fans of the SpongeBob SquarePants television show? If you played Destruction Derby back in the 90s and have perhaps played SpongeBob's Boating Bash as well, how do the games compare?